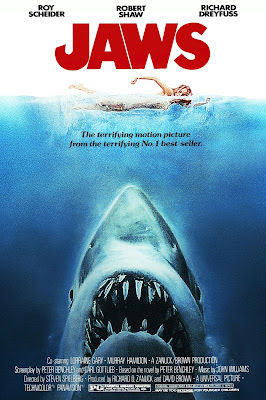 Director Steven Spielberg's thriller Jaws (1975) is one of the classic movies Netflix Instant added in September. September is turning into shark month on Netflix Instant with the streaming giant adding director Steven Spielberg's classic Jaws (1975) and three of its sequels. If you're not into great whites, there's a documentary about Gregory Peck, a silent film directed by Fritz Lang, A Doris Day rom-com, and John Wayne in an Academy Award winning performance. A Conversation With Gregory Peck (1999): This documentary from filmmaker Barbara Kopple is a loving tribute to one of old Hollywood's best actors and finest gentlemen. The movie follows Peck on a speaking tour and shows him interacting with fans, family and friends, and dignitaries like former President Bill Clinton and director Martin Scorsese. Destiny (1921): This avant-garde silent film directed by Lang is better known by its German name, Der mude Tod. The film, which is divided into three parts, revolves around love conquering death. Destiny influenced everything from Douglas Fairbanks' version of The Thief of Baghdad (1924) to the works of director Alfred Hitchcock. Do Not Disturb (1965): This rom-com co-starring Day's frequent screen partner Rod Taylor, features the bubbly actress as a housewife who believes her husband may be having an affair with his assistant (Maura McGiveney). Complications arise when Day gets ideas of her own after a handsome Italian man (Sergio Fantoni) begins redecorating the couple's home. True Grit (1969): The first adaptation of Charles Portis' Western novel isn't as good as the 2010 Coen Brother's film, but it has a lot to recommend it, including Robert Duvall as villain Lucky Ned Pepper and Wayne in an Oscar-winning performance. There's nothing quite like the Duke issuing a "rat writ" to a corn-eating rodent or single-handedly taking on Ned Pepper's gang in the movie's heart-pounding climax.